The fifth name on the head stone is that of Esther Anne Loh. She was born Esther Anne Jones, on September 9th 1860 and although her married name might appear unusual enough to render her more easily traceable, we know little about her life in Paddington. She married Austrian-born Anton Von Padua Loh in 1877 at St Martin in the Fields and had several children, one of whom, Francis, was killed in action on October 30th 1918. Her daughter, Miriam, lived with her at 34 Clarendon Gardens, Maida Vale, London. Esther and Miriam remained at the same address throughout the 1930s with up to six lodgers in their large house which still stands, grandly, in Maida Vale. A high explosive bomb fell just behind Clarendon Gardens during the blitz and her house may have been damaged, but we know that her daughter Miriam was still living there in 1945. Why was Esther evacuated to Nevern? Did she know Annie E Smith or Agnes M Bennett who were also evacuated to Nevern from the Paddington area? So many unanswered questions. At Llwyngwair, however, Mrs Loh made an impression on Dilys Roberts, daughter of the farmer who worked on the estate, who still lives locally. She was nine or ten years old at the time and it was her job, every morning , to take the milk to the ladies. She’d go down the back steps and leave the milk in the kitchen. It didn’t take long, but on a Sunday she’d linger with the evacuees and listen to the Service, enchanted by the music played on banjo, accordion and piano by the Salvation Army staff. Dilys thought that all the ladies were very nice, but perhaps Esther Loh spent more time with her than the others and 75 years on, it’s Esther Loh’s name that she still remembers – Mrs Loh, who used to go out in a pony and trap with her friend, Mrs Thomas from Pont Clydach. What were the other ladies doing while Esther was riding around the lanes? Some of them may have been doing embroidery, remembers Dilys. 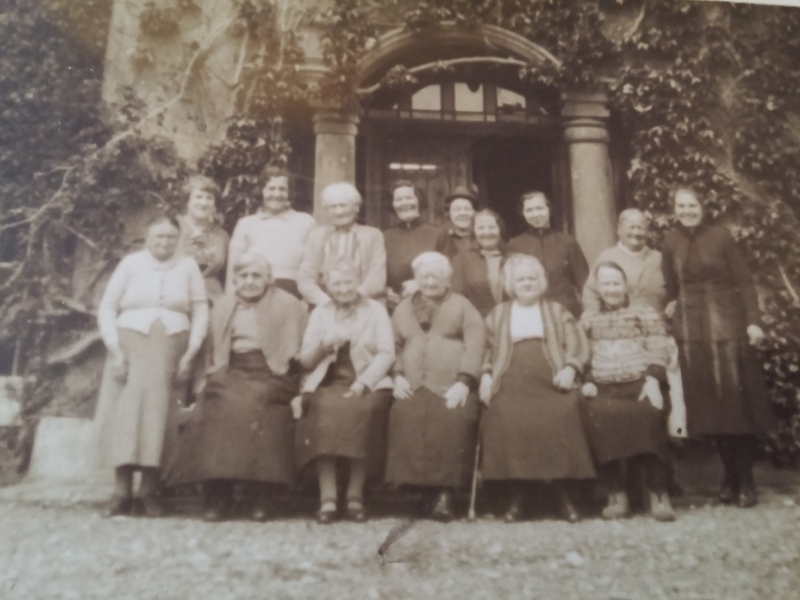 This photo of the Llwyngwair ladies probably includes Esther Loh, but so far no-one has been able to identify her. Dilys remembers that Mrs Loh wore glasses but she must have taken them off for the camera. Llwyngair ladies. Photo courtesy of Jan Ramos. 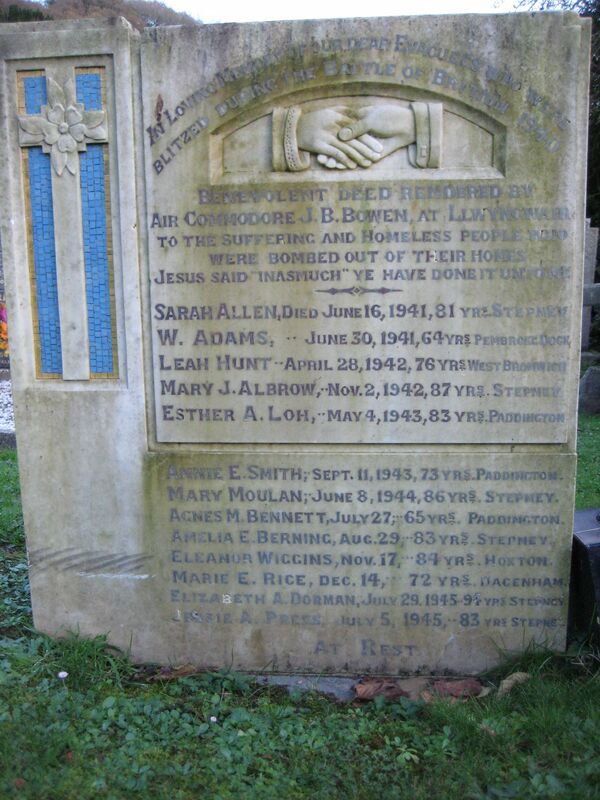 This entry was posted in History, Religion and tagged Esther Loh, evacuees, Llwyngwair, Salvation Army, Second World War. Bookmark the permalink. So many extraordinary stories, fading but partly recoverable with luck and with determined patience on your part. I’m overawed by both their histories and your sleuthing. I can’t take credit for the ‘ancestry’ investigations. That was all done by Heather, who has been brilliant. It’s been an enjoyable and very rewarding project and, given that the period we were researching was not so long ago, surprisingly difficult!